While galleryHOMELAND went big in April (See Go Big Or… ), two other artists in Northeast Portland are going decidedly small with their art. Stan Peterson and Stephanie Wiarda, two veterans of the Portland art scene, are rethinking the gallery experience, reducing the size and length of exhibits, and even taking the experience mobile. He’s a veteran woodcarver and she’s a silversmith and gallerist. 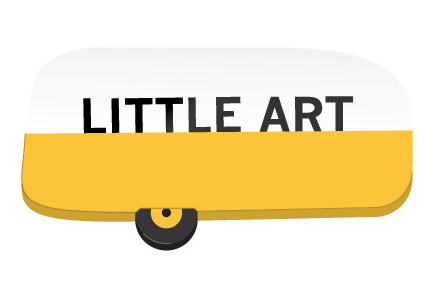 Little Art in the Trailer is a 20-foot Airstream travel trailer that Peterson and Wiarda have outfitted as an art gallery. It sits in the driveway of their Parkrose home, where they host one-day shows once a month featuring works from local artists. 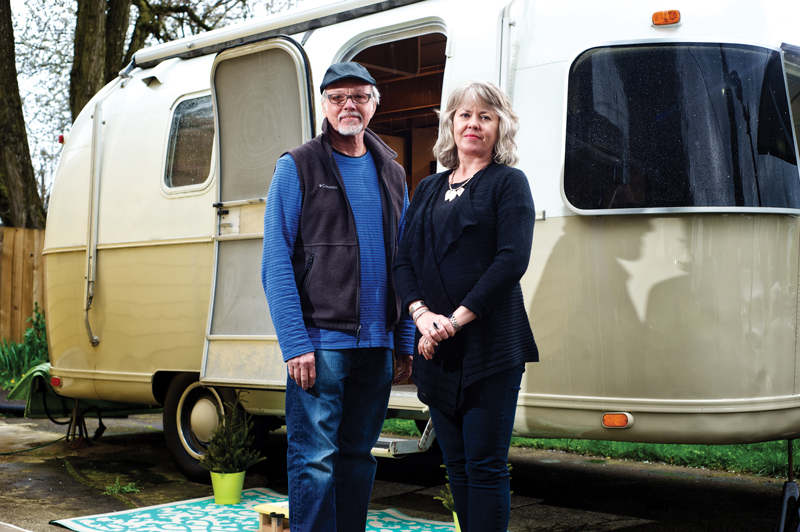 After a stint in Oakland, the need for a trailer dissipated when Peterson moved back to Portland and he and Wiarda settled into their Northeast home. Peterson built a woodworking studio in the adjacent garage and focused on being a full-time artist for the first time in his life. 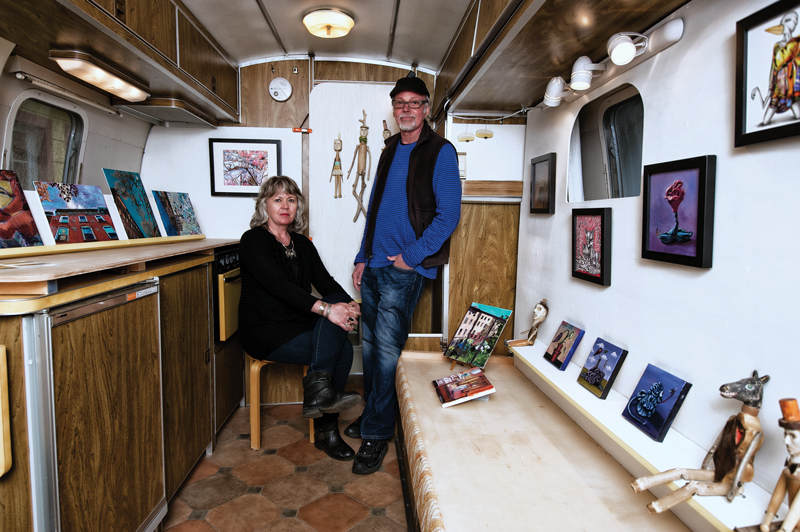 Although the concept of mobile art remained in their minds, the couple was nudged along by a call from an Airstream dealer who Peterson had tasked with finding him a trailer. What they found was a 1973 Airstream Argosy, a limited edition trailer, and one of the only trailers that Airstream has ever offered in a painted finish. The couple modified the interior by transforming a bench seat along the far wall into a display shelf, behind it a new straight wall in front of the curved original for hanging art. They added new counters on top of the original kitchenette and blocked off the bathroom for more hanging space. What they left, however, is the camping trailer feel. The wood grains of the cupboards remain, as does the bench seat beneath the wrap-around windows at the front of the rig. It’s a tight fit, though. Maybe six viewers can fit in the trailer at once with a couple more sitting on the front bench seat. Because of this Wiarda and Peterson keep the living room of their house open for overflow and to serve snacks. To further address this overflow, the couple plans to outfit the yard adjacent to the trailer with more seating this summer. The couple met in 2005 when Wiarda began carrying Peterson’s work at her Beppu Wiarda Gallery in The Pearl. They cite the challenges Wiarda experienced while running a traditional gallery as yet another inspiration to start Little Art. Art-goers’ traffic patterns change as neighborhoods evolve, leases for brick-and-mortar spaces pose other challenges (See Lighter Than Air But Too Heavy for the Mall ), and struggling economies hit art galleries particularly hard. Peterson and Wiarda show their art twice a year in the trailer, and when not exhibiting their work, they showcase works by other artists. At the moment these shows are scheduled to take place at the trailer’s current location at their home. Going mobile is something they are easing into, but they hope to inspire other artist and gallerists to consider such a movable feast as well. The couple envision pods of pop-up art fairs if others pick up the idea. “We’re using this as a party and event space right now, showing art of emerging and mid-career artists,” says Peterson. They debuted in February, showcasing the work of painter Emily Bates. “She’s the type of artist that I was attracted to when I moved back to Portland,” Peterson says of Bates. “They don’t have regular representation, but I can see there’s a career that’s going to take off because they have so much skill,” notes Peterson, speaking of Bates, as well as other new, emerging artists. After Bates’ exhibit, Shannon Richardson, who Wiarda knew from her days with Blackfish Gallery and Beppu Wiarda, showed her work. April’s show featured Jennifer Griffo, Stephanie Brockway, and Leah Kohlenberg. In June, Wiarda and Peterson will show their work: Wiarda’s Sterling Feathers and Leaves for Ears and Neck and Peterson’s Rescue Dogs. In September they plan to host a group show, representing five or more artists. Find more information on Little Art in the Trailer at LittleArtInTheTrailer.com.